An old man prays for death so that he will no longer be a burden to his granddaughter. A swordsman dressed in black appears behind him and grants his request with a single brutal stroke. An avenging angel? Hardly. Ryunosuke Tsukue (Tatsuya Nakadai) is a samurai obsessed with perfecting his form. When we meet him his monomania has already left him alienated and unhinged; as the film progresses and his few human contacts dwindle it will drive him to madness. He's also our protagonist. Director Kihachi Okamoto, working from a screenplay by Shinobu Hashimoto, adapted “The Sword of Doom” (1966) from the popular serialized novel by Kaizan Nakazato. In the novel (according to the fine essay written by critic Geoffrey O'Brien and included with this disc) Ryunosuke, who plies his trade during the mid to late 1800s in shogunate Japan, embraces evil because he is destined to do so in the author's expression of Mahayana Buddhism. The character, however, quickly assumed his own life in popular culture, becoming a sympathetic anti-hero before such figures became more prevalent. Okamoto doesn't delve too deeply into his protagonist's psyche and Nakadai's performance is a highly physical one, not just the choreographed hacking and slashing but also through intense glowering expressions reminiscent of the trademark Kubrick stare that augurs incipient breakdown. Often he lurks on the periphery before submitting passively to his next battle and then his next, oddly detached from his amoral slaughter yet still completely committed to destruction. 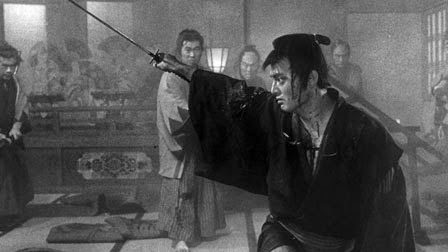 Ryunosuke is at conflict with the entire world but most specifically wants to challenge the great and noble swordplay teacher Shimada (Toshiro Mifune), the only man whose form exceeds his. 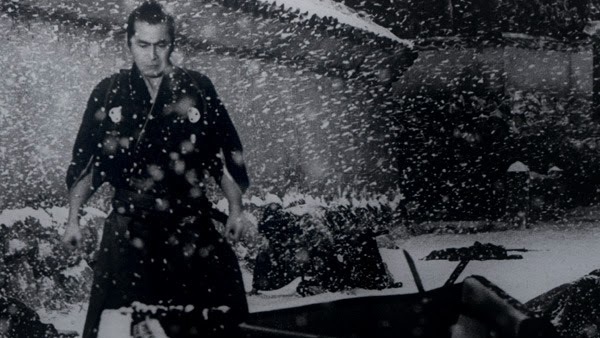 If there's a significant disappointment in this film, it's that we don't get nearly as much Mifune as we want ,though his big scene, a gorgeously filmed and staged ambush in the snow, is one of the film's highlights. Aside from that he's mostly relegated to a minor supporting role. The narrative is episodic in nature, leaping forward in time only to remind us of how little poor Ryunosuke has changed or is capable of changing; complaining about a lack of character development would simply miss the point. He briefly interrupts his martial pursuits for a half-formed fixation on an innocent young woman (Yoko Naito) who shows him a moment of kindness, but intimacy just isn't in his nature. The film's appeal relies heavily on the brooding charisma of its lead and on the Grand Guignol finale in which Ryunosuke battles foes both imagined and real. Here he becomes almost completely robotic though still graceful as a killing machine. New rivals materialize out of thin air and he keeps hacking away. He is sliced and diced by the endless horde and just when he looks ready to fall, he hacks some more, his sword a flashing metronome. I won't spoil the ending for you, but by this point in this bleak story one gets the impression that the worst fate for our hero would be to survive and thus be doomed to kill for all eternity. The film is presented in its original 2.35:1 aspect ratio. 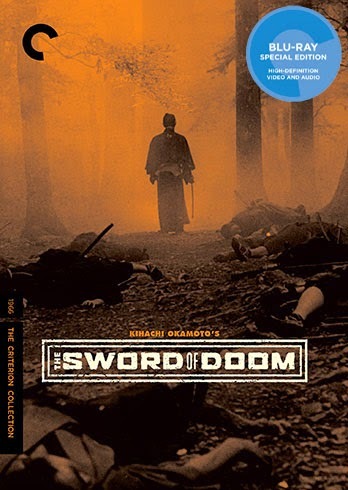 Criterion originally released “Sword of Doom” on DVD in 2005. The transfer was fine, but this 1080p transfer represents a significant upgrade with much sharper image detail and rich black-and-white contrast. It's possible that necessary boosting accounts for a few scenes where the grain isn't as prominent, but overall this high-def transfer looks excellent. The linear PCM mono track is crisp but more functional than dynamic. Not a lot to say on this one, just a solid, professional job with no evident distortion. Optional English subtitles support the Japanese audio. The 2005 release was strictly bare bones. Criterion hasn't dug up much for this Blu-ray release, but at least we get a newly recorded commentary track by scholar Stephen Prince and a Trailer (2 min.) I have only had a chance to sample Prince's commentary but it is loaded with the usual expertise Prince brings to his analysis of Japanese cinema. The slim fold-out insert booklet features the same essay by critic Geoffrey O'Brien that was included with the 2005 release. Stylish and bleak, “Sword of Doom” might be the perfect date movie... for the right date. The extras are slim but the transfer is strong. Samurai fan will certainly enjoy this high-def upgrade.